"When you're out exploring, keep your ears open for crackling flames—it may save you!" Flame Atronachs are a common yet deadly Daedric creature, of an almost completely malevolent nature. Their graceful motion hides a desire to annihilate all mortals they encounter. They float across the ground, spinning and twirling at leisure, while wreathed in magical fires. When Molag Bal banished flame atronachs from his realm one of his denizens took it upon himself to find a replacement. After searching over 37,000 planes and realms he found a suitable replacement on the Fourth Sinus of Takubar, the apparent inversion of the flame atronach known as the cold-flame atronach. As they are considered Daedric creatures, flame atronachs are especially vulnerable to Fighters Guild abilities. A basic ranged attack that does minor flame damage. The atronach surrounds itself in an aura of flames, doing minor flame damage over time to all players near it. The atronach summons a pillar of flame from the ground that does moderate flame damage to all players as indicated by a red circle. 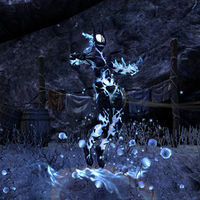 When defeated, the flame atronach explodes, dealing moderate flame damage to all players around its body as indicated by a red circle. This page was last modified on 7 December 2018, at 21:32.